Many dry tropical areas are wild, strange-looking places. To me, one of the strangest combinations is the unbranched columnar cactus Cephalocereus columna-trajani (the cactus in the left foreground) occurring with a member of the Century Plant Family (Agavaceae) Beaucarnea gracilis, the fat-trunked tree with shaving brush-like tufts of leaves on skinny stems that can be seen in the middle of the photo. 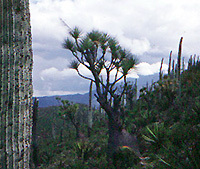 Other plants in this photo are Century Plants (Agave), and Barrel Cacti (Echinocactus).